From our flagship location in Maine, American Steel & Aluminum provides support to our other divisions. This is the heart of our entire operation and our corporate center. 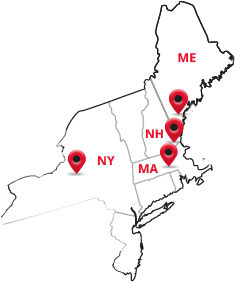 With its central location and easy access to the Maine Turnpike, I-290, I-395, and I-85, it can serve all of New England, New York, and New Jersey. Over its 104,000 square feet, we operate four slitters, two leveling cut-to-length lines, one shear and a bar saw. Our Auburn plant is ISO 9001:2008 certified. We invite you to review our Quality Assurance Manual online.